a few hiccups in the proceedings this week. not the sort of hiccups which cause you to be driven insane and drink lots (water that is) but nice hiccups involving lovely folks and my book pennings. one of my hiccups involved a pottle around Goodwill in the big city with Marjan. upon pottling i came across a lovely peachy blanket for the even lovelier sum of $3. i exclaimed to Marjan this blanket had 'little olive' written all over it. arriving home to my shed i washed said peachy blanket and laid it on the couch. as soon as i had done so, i was overcome with little blanket lust, i wished to keep my newly found blanket to myself and not share it with Little Olive. 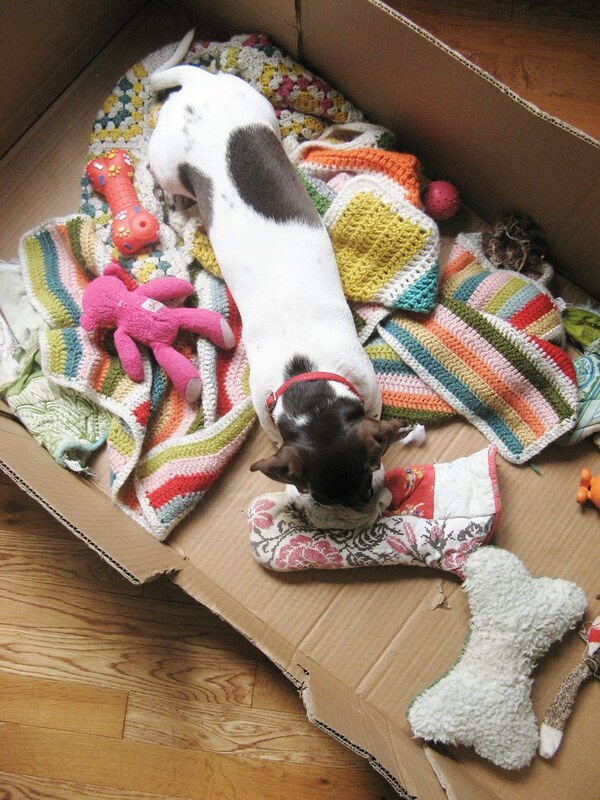 such was my wanting for the blanket, i hid it from Little Olive less she see its yarny beauty and become attached. this morning however i have given myself a stern talking to about Little Olive's need being greater than mine (how i came to that conclusion is beyond me as we all know, the little doggie has more crocheted blankets than any other doggie i know) but still i did. my pennings are all starting to come together and tomorrow my man is taking me to work with him. it is not 'take your woman to work' day, rather because he had a bright idea as i sat in bed this morning in the early hours explaining my inability to visualize what i had written in a book form. so he suggested i come to his work place and print off all my pennings and then read them as if they were a book, therefore i would have a better idea of whether indeed i had repeated myself on several occasions, where gapping big holes of important pennings were missing and perhaps as he also suggested, i may actually say to myself, "blimey Tif, despite your doubting ways, you hold a book in your hand"
this is terribly thrilling, for i have never been and sat in his office at work, due to allergies bought on by corporate work spaces but it will be fine and dandy for i shall be sure to take my allergy medicine an hour before i arrive. i am wondering if it would be nice of me to bring a sack lunch for us, a marmalade sandwich for him and chocolate spread on ryvita for me. i think i failed to mention this little detail before, but i have given up white toast this new year and in its place i now have ryvita. it is not far off cardboard but when butter and Cadbury's chocolate spread is a top, it becomes edible. i would have to sandwich two ryvitas together to avoid chocolate spread getting all over his marmalade sandwich but it would be quite a nice moment of sharing. "i can't find my documents on this little usb thingy, oh my lord, i have lost my book! it is gone, GONE forever... this is a tragedy, one of epic proportions. where for art thou my book"
"look why don't you go home to the shed and i'll sort it"
with an exasperated look upon his face accompanied by another grey hair. suddenly all will be forgiven, in that instant he will forget my disabilities with computers, my inabilities to stay calm and focused and transport himself back to 25 years ago when we first met and he fell for my... well actually i do not know what he fell for, but he must have fallen for something to have stayed around so long. 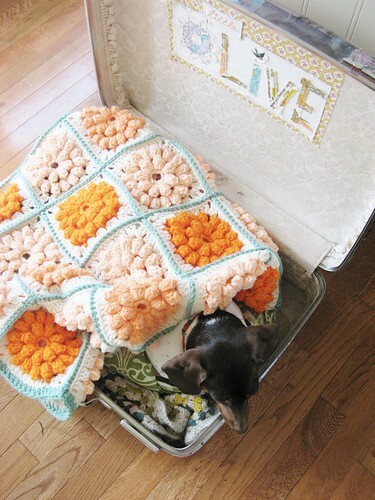 That is such a fabulously sweet blankie!! ♥ My Louie (1/2 Maltese - 1/2 Yorkie) looked at me with jealousy when I showed him Little Olive with her new snuggly. Good luck with the printing of the papers and finding of the files! Ohh that blanket i georgeus... aswell as little Olives bed! Soo sweet! Your man had a good idea - and you will probably be pleasantly surprised by what you have already accomplished. You always make me laugh! I look forward to your unique point of view in your writing. I just love it! It is somewhat of a travesty that that very special blanket was just $3. What is the world coming to? Also, I think you are wise to save the marmalade sandwich for untold emergencies. Also, I can't wait to buy your book! drooling over that yummy, yummy blanket. what an amazing find. Oh wauw, what a beautie of a blanket is that!! 1. I have no idea what pottling is but I like the sound of it. I plan on doing some as soon as I get a chance! 3. You are a brave soul for facing ryvita on a regular basis! Kudos to you! 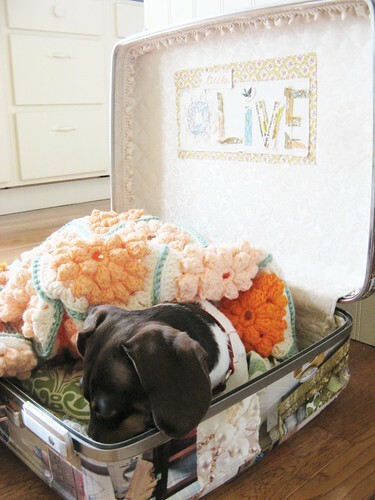 Oh that is just the prettiest blanket, lucky Olive..! Oh now I want marmalade on toast! But I'm in bed and I have no marmalade! Dear Dottie ~ ~ I don't even care for most vintage thingies and I certainly would not be found shopping for them at a thrift store, but I read your blog faithfully because you are the most delightful writer and you make my day! Can't wait for your book!! wonderful new blanket...i can understand your covetous(?) ways....hope you have fun "at the office"! this is so cute and funny, you are too. i love the post, blanket , spoilt crochet doggy , corporate allergy overriding , and of course, the beginnings of book in hand. yah! If only everything could be made right again by simply offering a marmalade sandwich. Perhaps I should start carrying one around. What a sweet little blankie! Olive is a very lucky pup! That blankie is beautiful! I would have wanted to keep it all to myself too. She will love you forever! But I appreciate your taste in vintage findings, your personal work and all about...it`s so refreshing and you seem to me like a very interesting person.A very talented, artistically person. Have a wonderful weekend and many greetings from ol` europe, germany! Oh Tif....I laughed so hard just now I spilt my coffee all over my keyboard....I can ONLY imagine how LOUD MR DA's sobs would be as they reverberated against the desk on which his rested....You're SUCH a meanie....hahahahahaha....Are you SURE a marmalade sandwhich would soothe hos poor tortured soul.... :o) ?? I for one can't WAIT to read your ramblings which I'm SURE will turn out just PEACHY....!! LOVING Little Olive's blankie & the generousity for which it was bestowed upon her....! What a lovely little girl! 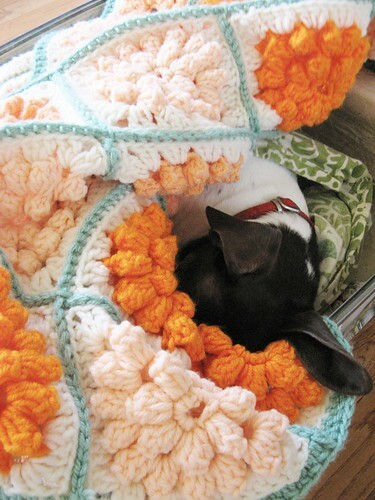 I know I would be very happy indeed with that crocheted blankie. Every pup should have such a good life! That blanket is just delicious! Very spring-y! The blanky is just FAB!!!!! What a wonderful find with that yarny goodness!! Lucky Olive!!!! you are always lovely and supportive and i do appreciate your kindness., and also you humor! 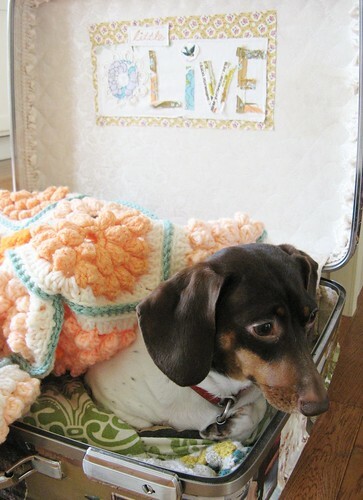 thank ou from me, little olive and her blanket, have a peachy weekend! Fabulous blankie, good choice Olive. Hope she didn't hide in the corporate brief case! Just brilliant, Tif. I think that marmalade sandwich will be a godsend indeed! 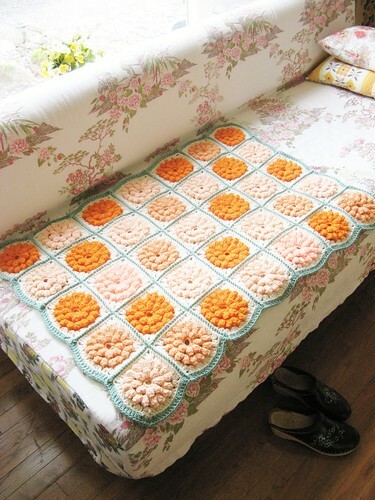 Peachy blanket is beautiful and so is little Olive! 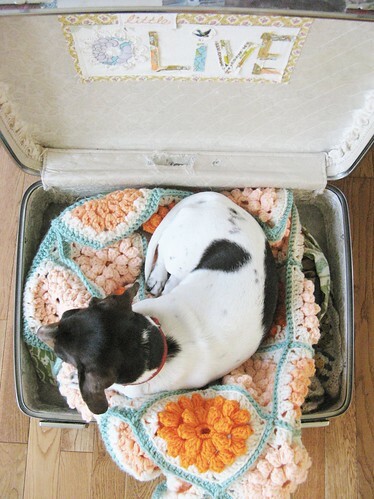 I love her suitcase bed! OMG, you crack me up so hard. My other half is asleep on the other couch & I'm trying my best to keep my laughter at bay, which makes me of course just want to laugh even harder. I can't wait for your book to come out. "i will sit in his spare swivelly chair and insist i read it all out loud, where upon my man in his swivelly chair will quietly place his head upon his desk, marmalade sandwich slightly out of reach and silently weep"
slightly out of reach and silently weeping! you're brilliant. This is so great to see your dog all kitted out in luxury I love it. We get told our cat is spoilt, it looks like you love your little Olive just as much as we love our little miss.